The Dollar/Yen pair remains on the back foot given the trade war concerns between the US and China. USD/JPY has only had slight movements during yesterday's session. There aren't any major news affecting this pair at the moment but our main focus will remain on the U.S. Dollar as it should provide the direction for the pair going forward. 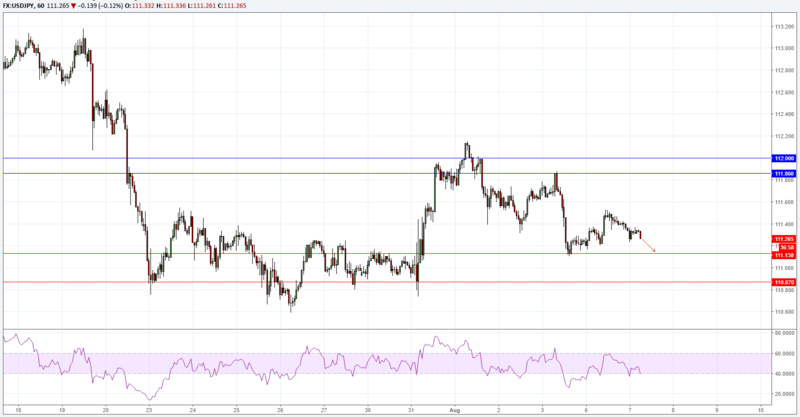 Looking at the chart, USD/JPY seems to be weak although it was trending upwards during yesterday's session but wasn't able to continue its move towards the resistance. The pair seems to be moving downwards towards the 111.13 support and it may even cross it to reach the 110.87 support.